Understand and use the CSS basic box model. Understand and work with the padding property. Understand and work with the margin property. Understand and use border properties. Understand and work with the box-sizing property. Understand and work with the box-shadow property. The content area contains the actual content of the element box (e.g., text, an image, a video, etc.). 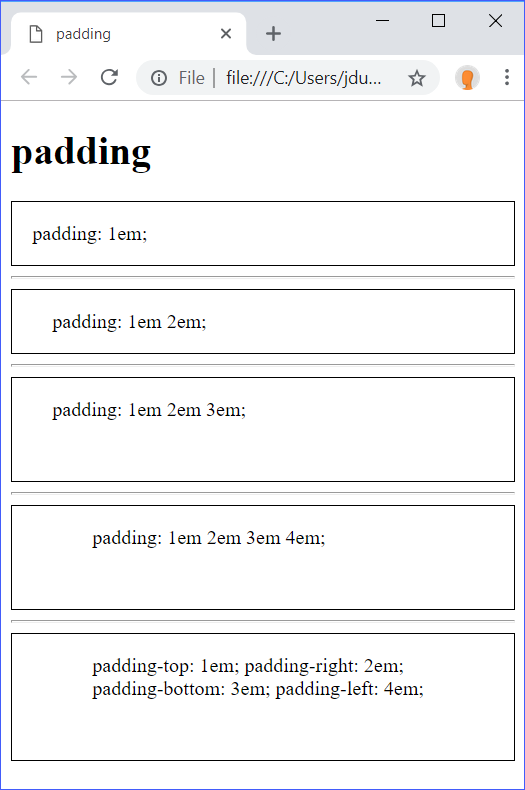 The padding area extends the content area to include padding inside the element box. 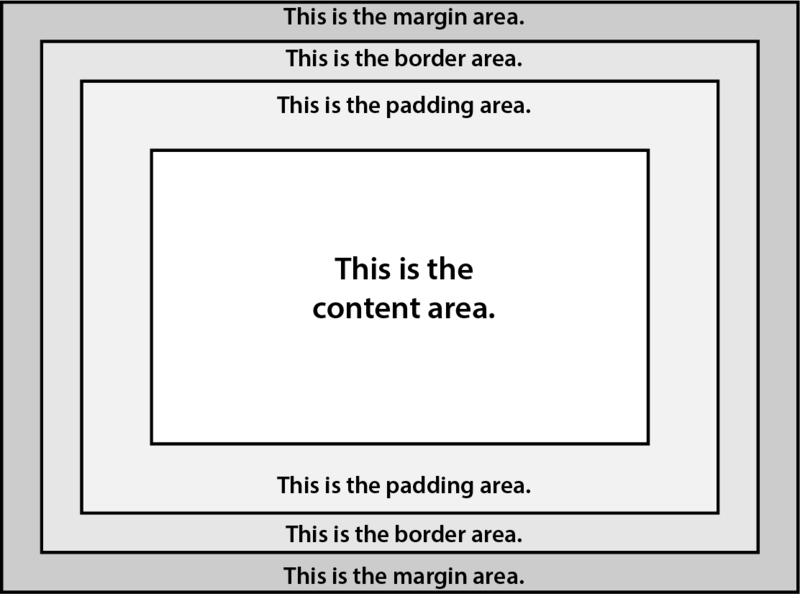 The border area extends the padding area to include a border around the element box. 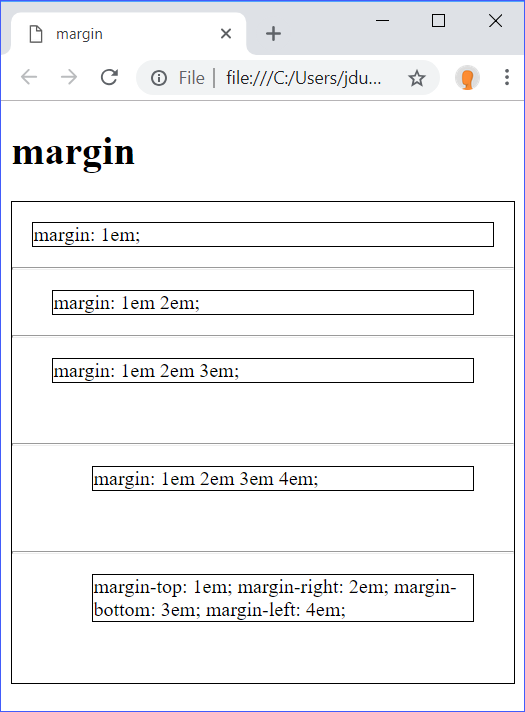 The margin area extends the border area to include a margin outside the element box. Throughout this lesson, we will be learning how to size and style these areas. Most modern browsers provide built-in development tools. 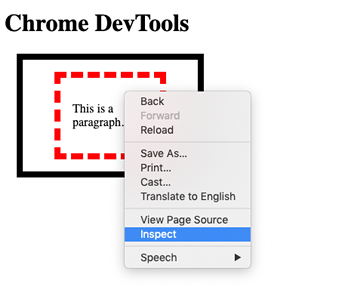 We will be looking at how the Elements panel in Google Chrome DevTools (https://developers.google.com/web/tools/chrome-devtools/css/) can be used with CSS. Command + Option + C for Mac. 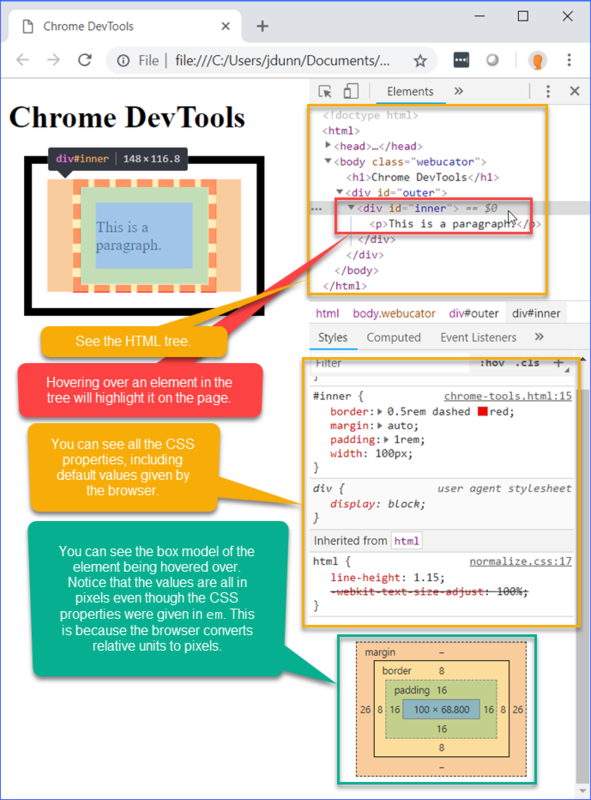 DevTools show the entire HTML tree. Going through this tree and selecting the different elements will show the CSS rules that affect those elements, including rules that are default values coming from the browser. DevTools will show the calculated values for width, height, margin, border, and padding in the element's box model diagram. 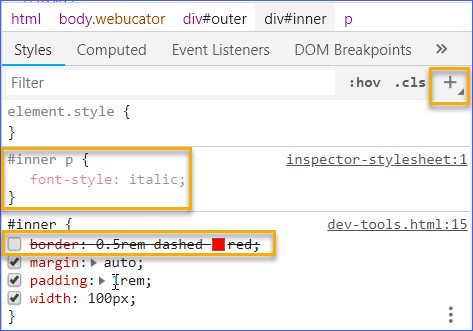 DevTools allows you to edit CSS properties in the browser by checking and unchecking existing properties (see the unchecked border property) or by creating new rules and properties (see the #inner p rule. These are created with the + sign in the upper right corner). The padding shorthand property is used to size an element's padding area. padding takes either length values specified in units (e.g., em, rem, px, etc. ), or percentage values relative to the width of the containing element. All values must be positive. When one value is specified, it applies to all four sides of the element. When two values are specified, the first value specifies the padding for the top and bottom and the second value specifies the padding for the left and right. When three values are specified, the first value is for the top, the second for the left and right, and the third for the bottom. When four values are specified, the values specify padding in a clockwise direction starting with the top (top, right, bottom, left). Alternatively, padding can be applied with the padding-top, padding-right, padding-bottom, and padding-left properties. We have included a border class to add a simple 1px black border around each div block so that the padding is visible. We will cover borders soon. When one value is specified, it applies the same margin to all four sides of the element. When two values are specified, the first value specifies the margin for the top and bottom and the second value specifies the margin for the left and right. When four values are specified, the values specify margin in a clockwise direction starting with the top (top, right, bottom, left). Alternatively, margin can be applied with the margin-top, margin-right, margin-bottom, and margin-left properties. 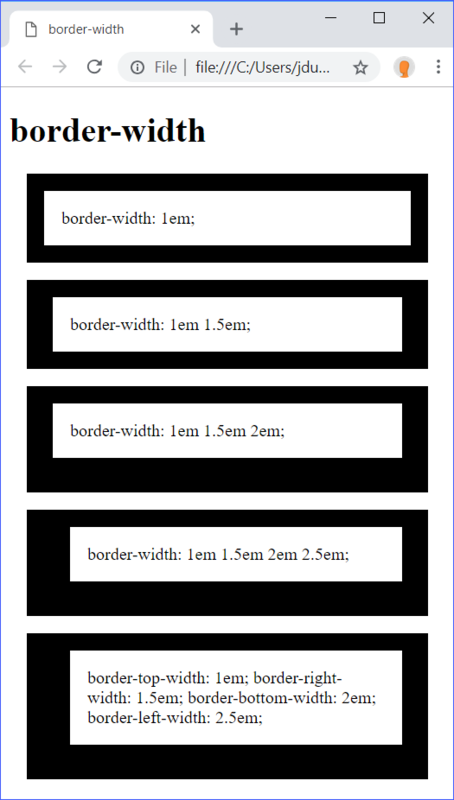 border-width - Specifies the thickness of the border in units (em, rem, px, etc.) or as a keywords (thin, medium, thick). The default is medium. border-style - Specifies the line style of the border as a keyword (none, solid, dotted, double, etc.). The default is none. For a full list of line style keywords, see Mozilla's border-style values list (https://developer.mozilla.org/en-US/docs/Web/CSS/border-style#Values). border-color - Specifies the color of the border as a color value. The default is the current value specified by the color property. As with any shorthand property, any unspecified values will be set to their default values. The outline (https://developer.mozilla.org/en-US/docs/Web/CSS/outline) shorthand property works exactly like the border shorthand property. However, while a border takes up space and is part of the box model, an outline does note take up space and is not part of the box model. We have included a padding class to add a little padding in each div block to push the border away from the content. The div with the border: 0.3rem blue style does not render because no border-style was specified and the default border-style is none. When one value is specified, it applies the same border width to all four sides of the element. When two values are specified, the first value specifies the border width for the top and bottom and the second value specifies the border width for the left and right. When four values are specified, the values specify border width in a clockwise direction starting with the top (top, right, bottom, left). Alternatively, border width can be applied with the border-top-width, border-right-width, border-bottom-width, and border-left-width properties. No border when border-style is none. Even with a border-width, an element will not show a border unless a border-style is specified. Notice the box class that we included to add a border-style of solid and a margin and padding of 1rem each. When one value is specified, it applies the same border style to all four sides of the element. When two values are specified, the first value specifies the border style for the top and bottom and the second value specifies the border style for the left and right. When four values are specified, the values specify border style in a clockwise direction starting with the top (top, right, bottom, left). Alternatively, border style can be applied with the border-top-style, border-right-style, border-bottom-style, and border-left-style properties. The border-color shorthand property is used to define the color of the top, right, bottom, and left borders. It can take up to four color values. When one value is specified, it applies the same border color to all four sides of the element. When two values are specified, the first value specifies the border color for the top and bottom and the second value specifies the border color for the left and right. When four values are specified, the values specify border color in a clockwise direction starting with the top (top, right, bottom, left). Alternatively, border color can be applied with the border-top-color, border-right-color, border-bottom-color, and border-left-color properties. The border-radius property offers an easy method for adding rounded corners to elements. Each corner can take either one (for circular corners) or two (for elliptical corners) radii value specified as either a length value in units (em, rem, px, etc.) or as a percentage of the width (horizontal) or height (vertical) of the box. When one value is specified, it applies the border radius to all four corners of the element. 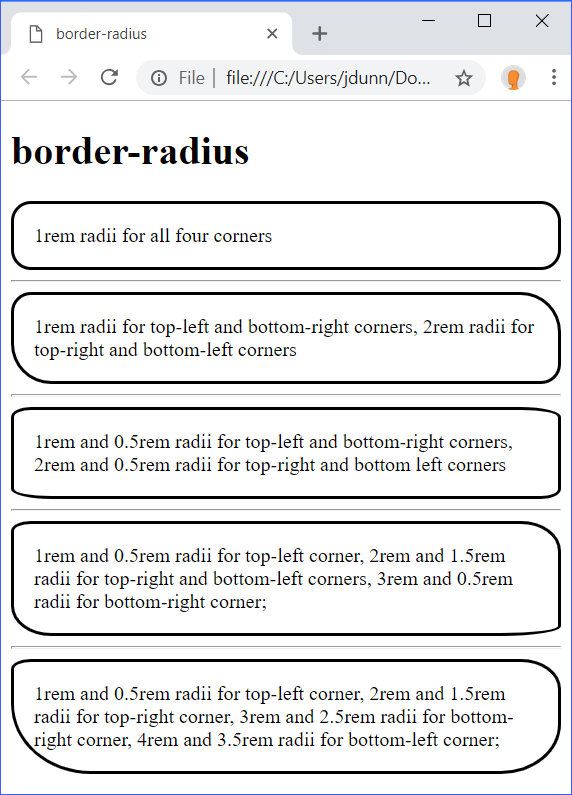 When two values are specified, the first value specifies the border radius for the top-left corner and the bottom-right and the second value specifies the border radius for the top-right corner and the bottom-left corner. When three values are specified, the first value is for the top-left, the second for the top-right and bottom-left, and the third for the bottom-right. When four values are specified, the values specify border radius in a clockwise direction starting with the top-left (top-left, top-right, bottom-right, bottom-left). To specify two radii values for each corner, the second radii are separated from the first radii by a forward slash (/), and they are applied to each corner in the same manner that the first radii are applied. For example, 1rem 2rem 3rem / 0.5rem 1.5rem would apply 1rem and 0.5rem radii to the top-left corner, 2rem and 1.5rem radii to the top-right and bottom-left corners, and 3rem and 0.5rem radii to the bottom-right corner. content-box - the default. When content-box is specified, width and height refer to the size of the content and do not include padding, border, or margin. 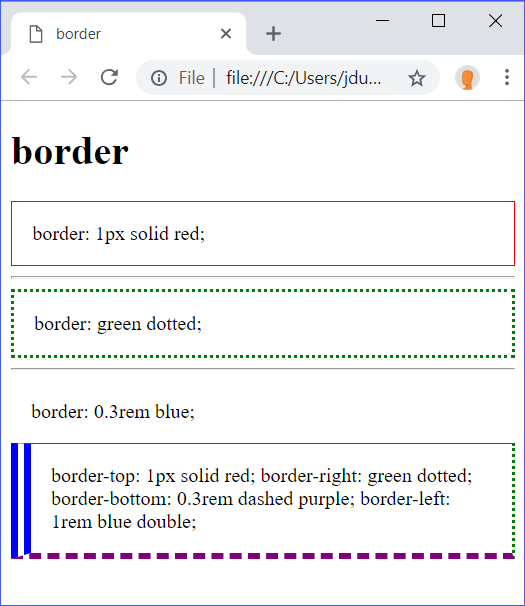 border-box - When border-box is specified, the width and height include content, padding, and border, but do not include margin. The containing parent boxes are both 300px by 300px. The children boxes are both set to 280px by 280px. 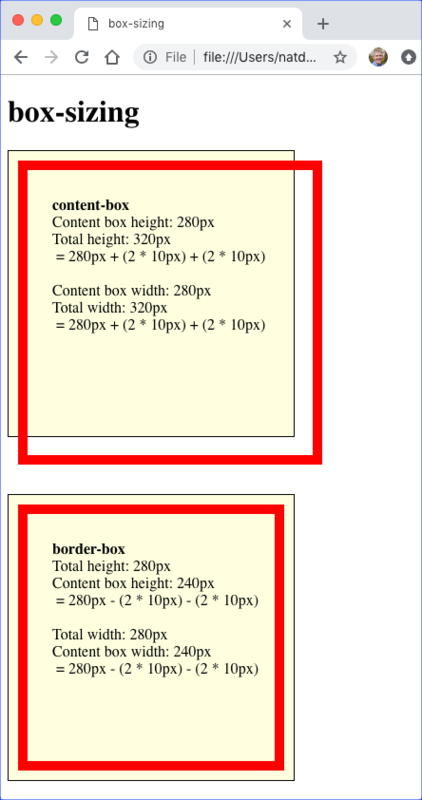 The border and padding of the first child box, which has box-sizing set to content-box, are added to the sizes, extending the box past the borders of the parent box. The border and padding of the second child box, which has box-sizing set to border-box, are not added to the sizes, so the box stays within the parent box. In addition to the height and width properties, there are also min-height, min-width, max-width, and max-height properties. These properties work exactly like height and width, except that they specify minimums and maximums. This means that if the window size increases, the box can expand up to its maximum values, and if the window shrinks, the box won't shrink more than its minimum values. Using these properties instead of height and width allows for more responsive designs. x-offset and y-offset: required length values. x-offset must come immediately before y-offset. x-offset specifies the horizontal displacement (positive values to the right and negative values to the left). y-offset specifies the vertical displacement (positive values below and negative values above). If both values are zero, the shadow will be directly behind the box. blur-radius: an optional length value that specifies the size of the blur effect. If included, this value must come after the two offset values. spread-radius: an optional length value that determines the size of the shadow. Positive values will make the shadow grow. Negative values will make the shadow shrink. 0 (the default) means it will be the same size as the box. If included, must be placed either immediately before or after the length values. If not included, the browser picks the color, so for consistency across browsers, it is a good idea to specify the shadow's color. inset: an optional keyword value that, when included, makes the shadow appear inside instead of outside of the box. 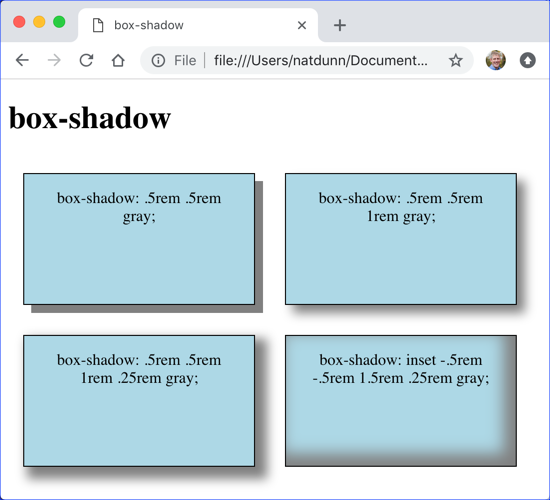 See Mozilla's Box-shadow generator (https://developer.mozilla.org/en-US/docs/Web/CSS/CSS_Background_and_Borders/Box-shadow_generator) for a great tool to help design box shadows. 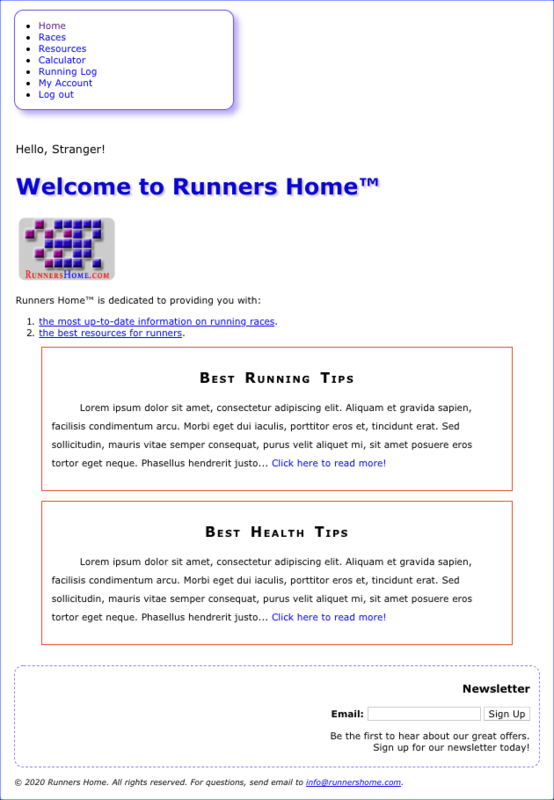 In this exercise, you will continue to work on the Runners Home page. Open BordersMarginAndPadding/Exercises/index.html in your editor. You will see the homepage for a website called Runners Home. 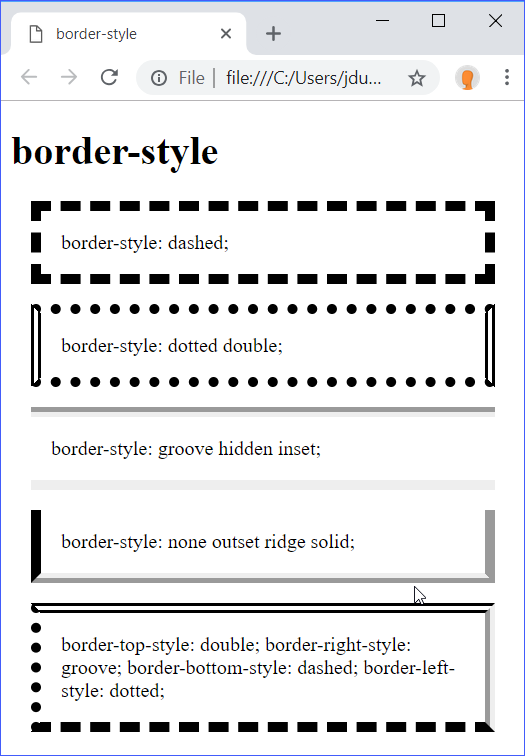 Open BordersMarginAndPadding/Exercises/styles.css. This is the stylesheet from the solution to the Text exercise. Feel free to continue working from your own stylesheet. Using your new knowledge of borders, margin, and padding, add some styles to this page. The object of this exercise is to practice using the properties you just learned about. Also, feel free to add or change any other properties that you know.